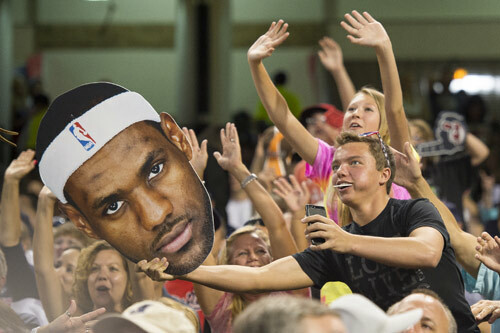 In July 2010, LeBron James crushed the hearts of Cleveland Cavaliers fans after announcing he was leaving the club and heading to Miami to join the Heat. Fast forward four years and two Championships later and the King has announced he is heading back home. It wasn’t that long ago that Cleveland Cavaliers fans were seen burning their LeBron James jerseys in effigy, while condemning him for leaving their beloved team. Even majority owner of the Cavaliers, Dan Gilbert, chimed in by writing a very critical and public letter to Cavs fans stating LeBron James’ decision to leave the club was “heartless, callous and cowardly betrayal”. The letter went on to accuse LeBron for deserting the team in a “narcissistic, self-promotional build-up”. Gilbert continued by stating the self-declared former “King” will be taking the “curse” with him down south. And until he does “right” by Cleveland and Ohio, James (and the town where he plays) will unfortunately own this dreaded spell and bad karma. Hmmm, if you call four NBA Finals appearances and two NBA Championships bad karma, Gilbert is hoping LeBron packs his dreaded spell for the plane ride to Cleveland. But seriously, if there is anyone who wished they could eat their words, it would be Dan Gilbert. As he flew to meet LeBron in Florida last Sunday, he admitted the now infamous letter was punched out in 45 minutes while in a very emotional state. His main goal now is to “clear the air” with LeBron and mend their relationship. Perhaps in the mind of Gilbert, LeBron’s return is his way of doing “right” by Cleveland and Ohio. But while Dan Gilbert and LeBron may hug it out on a private jet over a bottle of Dom and caviar, how will the city of Cleveland and Cavs fans welcome back their prodigal son? This very question obviously weighed heavy on the mind of King James himself. In fact so much, he was compelled to work with Sports Illustrated and publish a full-page exclusive essay on his decision to leave the Miami Heat and return to the Cleveland Cavaliers. Well, now we all know when and we all know why. The league’s best player signed a two-year deal with his former club for a reported $42.2 million. LeBron could’ve signed a four-year contract worth more than $88 million from the Cavs. But a two-year stint gives his power to negotiate his salary in couple years. LeBron will also be able to take advantage of the league’s upcoming TV deal, which is expected to increase the value of max contracts. The NBA and players share a near 50-50 split of revenue paid by TV Networks. It is reported LeBron James will make a ridiculous $21,573,398 next season in TV deals. But in all seriousness, the reasons behind LeBron’s returned to the Cavs are totally irrelevant. Despite a bitter and highly-publicized breakup four years ago, he is still the best player in the NBA and any team fortunate enough to sign (or resign) him, will benefit from his skills and leadership. The King’s homecoming should be celebrated. Understandably there will be some who will be reluctant to fully embrace his return. In this case, they should treat him like a sensational ex-lover reappearing in their lives. It may take a while to rebuild the trust but that ex will do anything humanly possible to make amends. Take advantage, Cavs fans. Sports chick: On a collision course? Sports chick: Is Sam too gay for NFL?